Denver has finally figured out that this is his forever home. He is gaining some weight and he no longer fears getting in the car to go somewhere thinking he’s having to be relocated again. He has acclimated so well to all of his surroundings and other family members from kids, cats, horses and most importantly, his new foster brother Beau, who was so sad from losing his life-long pal, Zeke, just a few months ago. They romp and play every day. He has indoor and outdoor manners, fetches, sits, comes when he’s called and so on and so on. He is impossible not to love. We are lucky to have found him. Denver is so much fun and we are so happy we decided to adopt a rescue boxer. 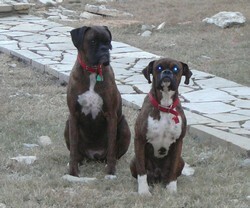 He and Beau got new matching collars for Christmas and they look so handsome wearing them.